Manny Pacquiao, who defeated Joshua Clottey on Saturday, appears no closer to a showdown with Floyd Mayweather Jr.
ARLINGTON, Tex. — The future of Manny Pacquiao — in politics, in boxing, in acting, singing or whatever whim he pursues next — remains clouded. Even his proposed megafight against Floyd Mayweather Jr. stands on shaky footing, far from reality despite worldwide intrigue. Soon, Pacquiao, 31, will return to the Philippines and begin his second political campaign, this time for a congressional seat and the right to represent about 400,000 people. He insisted that surveys showed him ahead, but even members of his entourage pronounced his chances as no better than 50-50. More likely, Pacquiao will be a long shot. The campaigning begins in earnest March 26 for the May election. Pacquiao’s platform centers on what he lacked while growing up in poverty: health care, education, employment. Not exactly the typical agenda of a man who makes his living disfiguring the faces of opponents. “I want to help the people,” is his stock answer regarding his political ambitions. Pacquiao’s previous political campaign, in 2007, was thrown together in a month. He alluded to advisers’ stealing the campaign money he doled out. He fought the prevalence of old-money politics and the perception that political victory would mean the end of his boxing career, perhaps his nation’s greatest source of pride. This time, Pacquiao started planning two years before the election. He built a better team. Everything about this campaign, Pacquiao said, is different from the first. He hopes the result will be different, too. All week, his promoter, Bob Arum of Top Rank Boxing, tried to dispel the notion that politics would interfere with Pacquiao’s boxing career. Arum did this by telling versions of the same joke. He noted how crime stops in the Philippines during Pacquiao’s fights, if only for a few hours, how the gangsters and the government call a truce, how dozens of politicians travel with Pacquiao to each bout, fighting to stand next to him in the ring. But politics presents only one hurdle. In his career, Pacquiao has fought 56 times, or five fewer bouts than Muhammad Ali. In those fights, Pacquiao has boxed 317 rounds, and he need look no further than his own corner, where his trainer, Freddie Roach, has Parkinson’s disease, to see the effects of repeated pounding. Last week, Roach floated the idea that Pacquiao could retire after Saturday. Pressed for clarification, Roach said that with the way Pacquiao trains, he could box for three more years, up to six times. But they will move forward with caution, aware of the toll already taken. 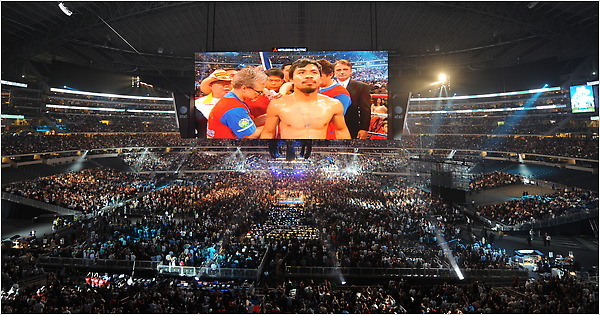 Team Pacquiao bubbled with excitement after the Clottey fight. The bout drew nearly 51,000 people to the stadium, despite Clottey’s lack of name recognition. Roach and Arum said they envisioned holding more fights here, perhaps pitting Pacquiao in a rematch against Juan Manuel Marquez. With seven titles won in seven weight classes, Pacquiao is running out of history to make, fighters to dominate and points to prove. In his last two fights, he easily dispatched two top welterweight contenders: Miguel Cotto and Clottey. Roach worries about the public backlash against another fight involving anyone other than Mayweather. He worries that Pacquiao and Mayweather will fight when “they’re like 50 years old,” long after interest and their skills wane — like the past-their-prime pugilists Roy Jones and Bernard Hopkins, Roach said, shrugging his shoulders and rolling his eyes. Negotiations with Mayweather will not resume until after he fights Shane Mosley on May 1 in Las Vegas. Even then, neither side appears ready to budge. Mayweather’s camp continues to insist on blood testing for performance-enhancing drugs. Pacquiao’s camp continues with its defamation lawsuit over the implication that Pacquiao is a doper. Of course, the reverse also applies. Pacquiao could simply agree to Mayweather’s demands for drug testing and end the rumors and innuendo. But the fighters appear past that point. Roach said the usually low-key Pacquiao “despises” Mayweather, that Pacquiao makes fun of Mayweather, imitating him during sparring. Money has a way of resolving disputes like these, particularly in boxing. But not always. The real possibility remains that Pacquiao and Mayweather will leave about $70 million (a conservative estimate) on the table, a bad move for boxing all the way around. Still, as Pacquiao turns his attention back to politics, the Mayweather negotiations will hover over the rest of his boxing career. The same is true for Mayweather, even as he prepares to fight Mosley. For this matter cannot be settled in civil court, nor the court of public opinion. It must be settled, whether Pacquiao wins his seat in the Philippine Congress or not, inside the ring. This entry was posted in Uncategorized and tagged filipino americans, filipinos, manny pacquiao, pacman, politics by rbvergara. Bookmark the permalink.